About a million years ago, I remember my sister, Patty, making home made brownies from scratch. I specifically remember that she didn't need to use a mixer because all the ingredients were easily just stirred together with a big wooden spoon. Years later, I asked her for that recipe, but I SWEAR that the one she gave me is not the one she made so long ago. Since then, I've been trying to find one that is similar. It was just a basic brownie, rich and fudgy, not too cakey, cut into squares that were not too thick. Well, I think I've FINALLY found it! I saw someone post it on Pinterest from a website called Yumly.com and frankly I have no idea whose recipe this is. 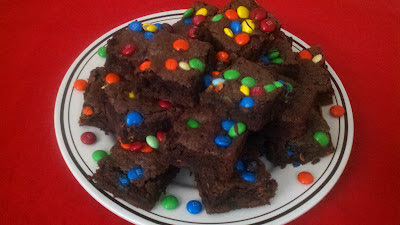 Anyway, yes, I know this one has M&Ms in it, but the basic brownie recipe is EXACTLY what I wanted!! Lots of melted butter and cocoa to make it as rich and fudgy as I remember! And the M&Ms just push it over the top. If you need to satisfy a chocolate craving THIS is the answer. They're simple and delicious and ready in no time. Mix flour, baking powder and salt in a bowl. In a separate bowl, stir cocoa into melted butter. Blend in sugar, eggs, and vanilla. Add dry ingredients to chocolate mixture. Stir in M&Ms. Pour batter into greased 13x9x2 inch pan. Bake 350 degrees F for 15 minutes. Sprinkle the top with more M&Ms. Then bake for another 15 minutes. If you use M&Ms Minis, they won't sink to the bottom of the brownies. If you only have regular M&Ms, you can still use them. Just toss them in a small bowl with a little bit of flour. Shake off the excess, then stir them into the brownie batter as directed. Don't have any M&Ms? Stir in your favorite chips or just omit them altogether!